This is a small shed (which may put some people off) but it has an incredible build quality and a real flexibility in that pent roof. 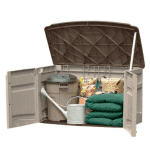 This is a compact plastic storage shed crafted from plastic. The measurements are 121 cm in width and 240 cm in depth. The internal width drops down to 118.2 cm internally, while the depth reduces to 234.7 cm internally. The roof is a traditional apex roof and this has been made from PVC vinyl. This is an interesting choice for a roof on a shed, but it kind of works pretty well here. The PVC vinyl doesn’t require maintenance, and it also has a very strong level of resistance to rainwater. In addition to this, you get even more value in the fact that the roof is a pent roof. This provides more protection against rainwater due to its enhanced run off facility. The pent roof also means you have a little more flexibility in the positioning of the unit in the garden. It can lean against a wall for instance. This gives you more choice, as well as giving a little more head room at one end of the building, as well as more height for storage. We liked the roof and we especially liked the fact that the vinyl has been included on top. There is plenty here to get excited about. When you have a building that you use for storage, you should expect the very best as regards framing. In this building this is what BillyOh delivers. The steel framing is of the highest quality, and it’s tough too. On top of that, the manufacturer has excelled itself by ensuring that the steel framing is galvanised too. This means there is no rust or erosion happening, and you get a building that is naturally longer lasting. The vinyl cladding is essentially maintenance free. It also helps with the cost of the unit. It won’t chip and is safe from any eroding agents. Therefore it is a great choice for cladding, and perfect for this particular building. That vinyl cladding goes a long way in this regard,. We cannot fault it, and the lack of a need for treatment is a great time saver as well as a saver financially. There is a 15 year warranty supplied with the building to give you even more peace of mind. 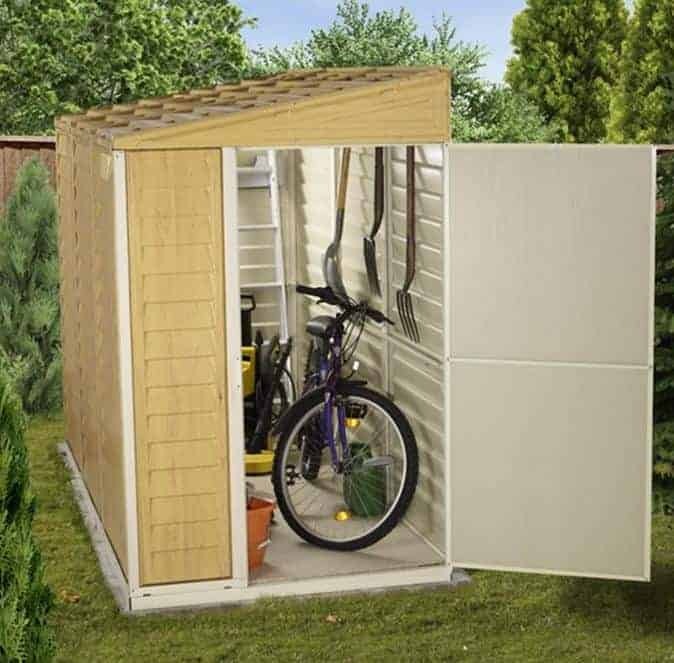 There are no windows here and this means it serves perfectly as a high quality security shed as well as a basic storage shed. The door is of a high quality, and it can be placed at either end of the building, which adds even more flexibility to your usage. Crucially, the door opening is incredibly generous. You get 76 cm in width when you open up that door, so there is ample room for larger and bulkier items. 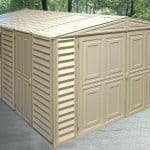 This is a real benefit and is quite unusual with a shed this size. With a lack of any windows to speak of, this building is officially classed as a security shd. It is safe from prying eyes,and this means that you have a building that should provide plenty of secure storage for years to come. This Is a very impressive shed for the price. One thing that we noticed after testing is that the building is absolutely 10% watertight, even if you don't apply the sealant that the company gives. This is an amazing amount of quality in such a low priced shed. The PVC works to protect it, as does the incredibly tough framing. We hinted at this above, but the build quality is superb,and should not cause any problems over the 15 years that the warranty protects against. 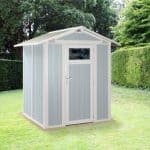 It is not the biggest shed in the world for the price, and this may be seen as a little bit of a problem. But with the other features this is more than made up for. As with all things garden building related, if it isn't big enough, it just isn’t. It takes some time to install, and the instructions can sometimes be a little vague. We suggest two people and at least one of you having some technical knowledge of building a unit like this one. This is tremendous value. If we were to pick at anything it would be the size. It’s not the biggest, but for what it is, the toughness and durability are hard to beat. 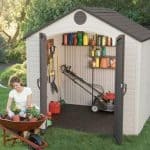 Final Thoughts: A great value compact shed that should be an easy choice for anyone who just needs some standard storage. 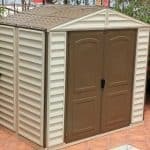 It is watertight and tough as old boots, and it has that pent roof so you can pretty much guarantee you can place it anywhere in the garden. But that size could well be an issue. If you need more size, nothing will make you buy this shed. If you just want some simple and basic storage that should allow you to store bikes and tools with absolute peace of mind, this is the building for you.